It is with great pride I am writing this Editorial piece, a task I have been doing since the inception of SKA until 1998. For a variety of reasons SKAN became dormant due mainly to reasons of health. Now since the Managing Committee under the leadership of Ron Rodrigues has brought in zest and enthusiasm to this community’s voice I will try to echo his efforts by re-launching SKAN. Internet production of SKAN lends itself a far better way of production and can reach many more readers - all that is required to read your SKAN is a internet computer, a laptop, a smart phone, an ipad, a wifi access or any modern device which can surf the internet. You are in business. All contributions will be greatly appreciated. SKA’S strictly adheres to the Constitution introduced at the launch of SKA in 1979 and ratified at the AGM on 15 October 2000. The family unit consists of the member’s spouse and all their dependants in the household under the age of 18 years. Member and spouse, but not the dependants, will have one vote each at AGMs. good value under present economic conditions. 1. Name. 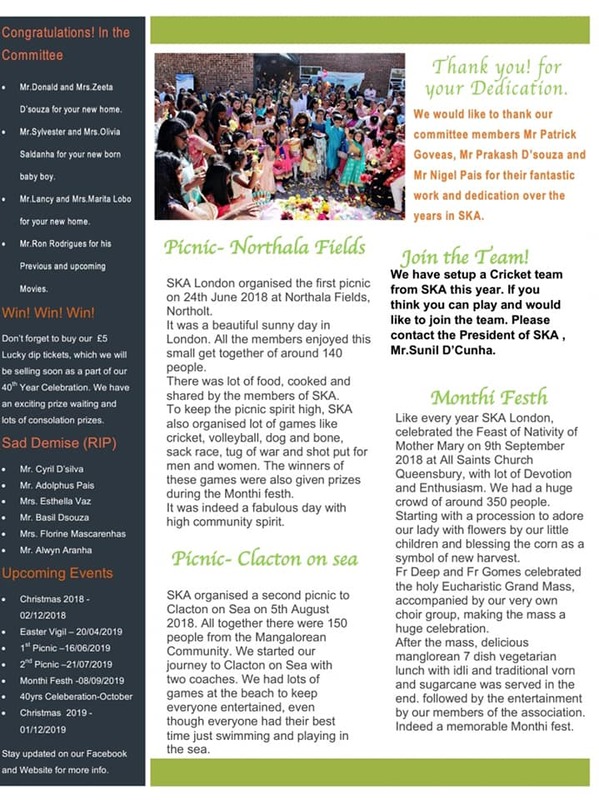 The Association shall be called South Kanara Association, London. 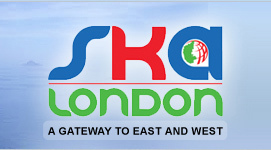 The Association will also be known by the abbreviation SKA. 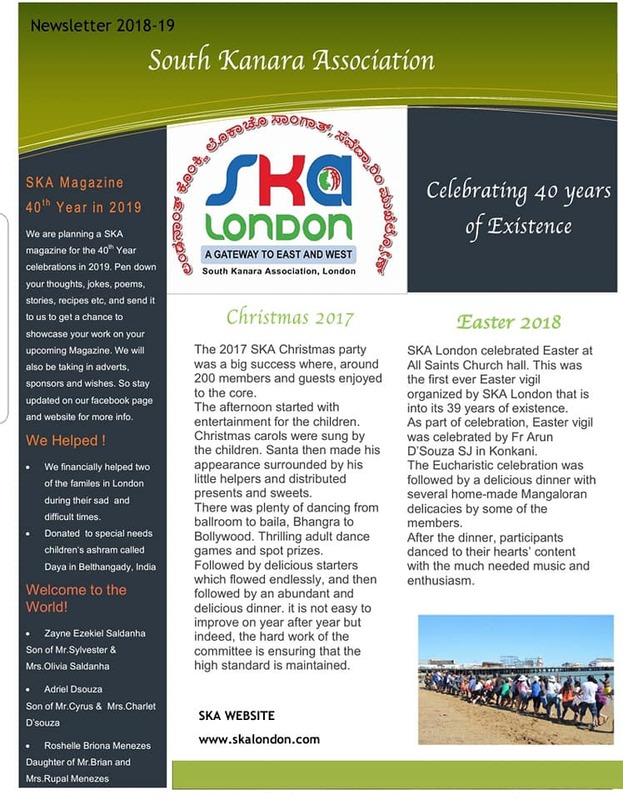 The Association’s NEWSLETTER shall be called SKAN. 2. Aims & Objects The aim of the Association is to promote contacts and develop good relationships between families of South Kanara origin from any where and to arrange social functions and outings for the benefit of members and their families. The objects shall be to bring together the people of South Kanara origin so that families can meet socially and develop their culture, language and music. The Association will maintain non-religious and non-political stand. The Association may also engage in charitable activities. 3. 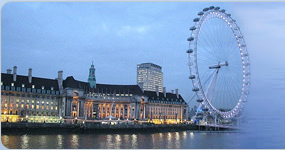 Membership Full membership of the Association is open to all the people of South Kanara origin residing in the United Kingdom or anywhere in the world. Application for membership must be made on an approved form and subject to Managing Committee’s right to refuse membership without giving reasons. The Membership Fee for Life and Ordinary members, will be fixed by the Managing Committee according to conditions prevalent at the time. A Joining Fee is payable by a new member to cover SKA’s incidental expenses. The Joining Fee will also be fixed by the Managing Committee from time to time. If an annual subscription of any Ordinary Member shall not have been paid before the end of the financial year, such membership shall lapse. Lapsed members can re-apply for membership of the Association. Member’s privileges and benefits may also be enjoyed by the Member’s spouse and family in his/her household. 4. Management & Election of Members to the Committee The administration and control of the South Kanara Association shall be vested in the Managing Committee which shall consist of not less than five duly elected members and two Permanent Members namely the founders of SKA, Mr Felix D’Souza and Mr Raymond Menezes. The Managing Committee shall include ipso facto the Chairman, the Secretary, and the Treasurer. All Committee Members shall have been elected or re-elected at the AGM. The term of office of the elected members of the Managing Committee will be three years. A retiring Committee Member will be eligible for re-election a second time. If any Committee Member seat falls vacant for any reason, the rest of the Committee may co-opt another member for the rest of the term. The Managing Committee shall meet at least four times a year. 5. Powers If in the opinion of the Managing Committee the conduct of any member shall be prejudicial to the interest of the Association, the Managing Committee may request such a member to resign from the Association. The Managing Committee may suspend a non-compliant member until the next General Body Meeting of SKA. At the General Body Meeting the suspended member will be entitled to state his/her case. Further action shall be decided by a simple majority at the General Body Meeting. The Managing Committee in suspending a member shall have been acting in good faith and with the Association’s sole interest foremost. 6. 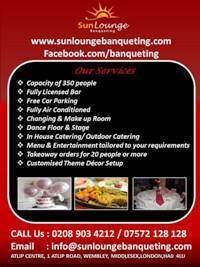 Finance The Managing Committee will operate Bank Accounts in the name of South Kanara Association, London. All monies of the Association will be paid into these accounts. The requirement for withdrawal for any money from SKA accounts will be two signatures from amongst the Chairman, the Treasurer and the Secretary. An Auditor with a knowledge or qualifications in accounting shall be elected at the AGM. An Auditor’s term of office shall be three years. If an Auditor’s seat shall fall vacant for whatever reason, the Managing Committee may co-opt another member with a knowledge or qualifications in accounting, to cover the period until the next AGM or the General Body Meeting. The Association’s Accounts shall be audited by the Auditor. The Association’s Financial Year End will be the thirtieth day of September in each year. A statement of audited accounts for the year shall be presented by the Treasurer to the AGM after the Financial Year End. Copies of accounts may be distributed to the members at the AGM. 7. Managing Committee Meetings All Committee Meetings shall have a quorum. Five Committee Members shall constitute a quorum for this purpose. In the absence of the elected Chairman, the Managing Committee may elect a Committee Member to chair the Meeting. Decisions shall be taken by a vote and a simple majority will suffice. In the event of tied vote, the Chairman chairing the meeting shall have casting vote. 8. Annual General Meeting & Voting Procedures The Annual General Meeting of the Association shall be convened in October of each year, by the Managing Committee. Written notice of the AGM shall be sent to all members at least 21 days before the AGM. The Chairman shall preside at the AGM. The Chairman, the Secretary and the Treasurer shall present their respective reports at the AGM. The elections of the office-bearers and the Managing Committee shall take place every three years. The nominations for any of the Offices or the Managing Committee may be sent by post or presented to the Secretary before the start of the AGM, duly proposed and seconded. The Chairman shall decide the method of voting at the AGM. A member and spouse shall be entitled to one vote each. 9. Extra-Ordinary General Meeting The Managing Committee shall convene within thirty days, an Extra-Ordinary General Meeting on receipt of notice signed by not less than 25% of the total membership. 10. General Amendments & Dissolution Amendments to this Constitution may be made only on a resolution to this effect at the Annual General Meeting, carried with a two-thirds majority of the members attending the meeting. The Managing Committee may deal with and settle any matter arising out of, or not covered by this Constitution. The Association may by a two-thirds majority of the total membership present at a Special Meeting called for this purpose, decide that the Association be wound up. Any property or monies belonging to the Association shall be donated to a deserving charity in South Kanara, India, decided at the Special Meeting.